Premium Compatible Label Tapes for the Brother P-Touch 1280CB printer. The Brother P-Touch 1280CB is a monochrome label printer that works on thermal transfer technology. The P-touch 1280CB electronic label printer produces self-adhesive all-purpose labels that are best for use in the office, laboratory or at home. The Brother P-Touch H100LB weighs 490 g and has a dimension of 22.6 x 18.8 x 8 cm. This label printer features a QWERTY keypad and has an LCD display screen of 1 line x 15 characters. This printer has 1-2 lines of printing enabled and it uses a variety of font-sizes and styles. The Brother P-Touch 1280CB Label Tapes have a tape cassette that is 12 mm x 8 m in dimensions and is laminated and black on white. This label printer is highly portable but has a very small footprint. 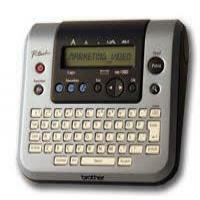 It uses Brother P-Touch 1280CB Label Tapes or TZ tapes and can print using the Helsinki fonts. The Brother P-Touch 1280CB works on thermal transfer technology. It is a monochrome label printer that uses a wide range of label tapes that are suited for use in the office, laboratory or at home. This label printer is portable and compact and uses a variety of label tapes. This label printer can print a wide range of styling and effects and uses a QWERTY keypad. But the problems with the printer are that it has a very small footprint and has 1-2 lines of printing enabled. Q. What kind of label tapes would you recommend for home use? Are they good enough for basic office purposes also? A. The Brother P-Touch Labeler is a compact label printer that uses the standard laminated Brother P-Touch 1280CB Label Tapes which are perfect for home use, small in size and portable in nature that it would do a great job if you take it for office use. Q. How to change the size of the characters? Press function key and continue pressing the cursor key until ‘SIZE’ is displayed on the screen. Press OK and then enter. Press the cursor key for long until the desired size is displayed. Press OK or enter key. The selected setting will be applied to the text. Q. When I try to print labels from my label printer, it shows an error message of ‘No Cassette’. What should I do? A. This indicates that you have tried to print a label when there is no cassette installed in the machine. Refer manual to install the cassette in order to continue with the printing job. Q. What is the size of the Brother P-Touch 1280CB Label Tape black on white? A. We provide two label sizes of 12mm and 9mm for the Brother P-Touch 1280CB. Q. Do you offer any discount if I order Brother P-Touch 1280CB Label Tapes from the site for the first time? A. Yes, there is a discount of 5% offered if you are purchasing the label tapes from the site for the first time. The discount will be given through promo codes that should be applied at the time of checkout. Also, if you purchase the Brother P-Touch 1280CB Label Tapes in bulk, then the cost of the tapes gets reduced. Q. What type of keypad does the label printer Brother P-Touch use for printing labels? A. The label printer can print a wide range of styling and effects and make use of QWERTY keypad to print labels. Q. What is the maximum printing speed offered by the Brother P-Touch 1280CB printer? A. The printing speed of the P-Touch 1280CB is up to 10mm per second. Q. Is the information provided on this site regarding the Brother P-Touch 1280CB Label Tapes is correct? A. There is no risk involved if you order any product from the site as we provide 100% satisfaction guarantee to our customers. We have described each product as accurately as possible. Despite our best efforts, there may be some variations in product descriptions or the price of the product, if so please contact Customer Services on +44(0)28 308 33221 and we will clarify your query. If by our own mistake we have not priced an item correctly, we will notify you regarding the correct price and you can decide if you want to continue with the order or not. Q. Can I use TZe tapes with this printer? Please let me know if there any difference between TZ tapes and TZe tapes? A. Yes, one can use TZe tapes with this printer. For the list of printers that are compatible with TZe tapes, you can refer the manual or can check online for the related models. TZe tapes are more environmentally friendly than TZ tapes and these tape cassettes use less plastic than those of TZ tapes. Q. The labels have jammed inside the printer. What should I do to prevent this situation, if I am using Brother P-Touch 1280CB Label Tapes? A. You must check the roller compartment and ensure that there is no dirt on the roller as this can jam the labels. In case the roller is dirty please clean it carefully using a cleaning sheet that comes along separately with the label printer. To know much more in detail about how to clean the roller using the cleaning sheet please refer the user manual or the Brother support site. This might resolves your issue.